Thu, Mar 28 2019 12:25 PM by ScottHope. 303 replies. .....I have made another one of my tables which might make things a little easier to find and or compare. 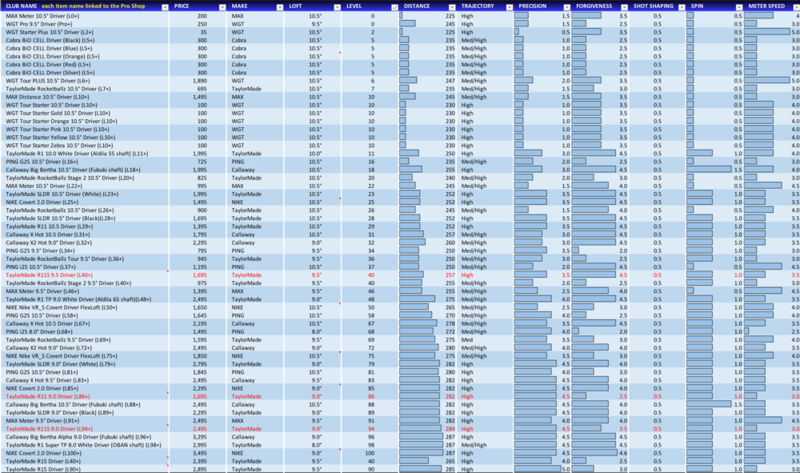 You're all welcome to have a mess about with it, the columns in the table are all sortable & filterable via the small square boxes next to the column names in the header row, and the club / ball names in the first column are all hyperlinked to their respective pages in the pro shop. Thank you for the time you put in on this . If I may also add that you post this on your Blog so that this does not get lost in the forums , And some of us who read the forums and see someone looking for this kind of Imfo can send them there to look . That's awesome bro.. well done. Thanks opy, done what you suggested. That was really nice. I'd suspect the irons would be hardest to get done, since they are of 8 clubs. Just don't forget to update at the end of the month when new clubs pop up. UPDATE : Added 3 Woods & hybrids. Thank you mukbrain, I will try to keep it up to date and correct any errors. Great effort as per usual, Scott. One thing though; having just had a look - you may want to redo the level column ( F) for the above clubs. As I type I'm level 101 but still 115 levels from being able to purchase the top level BB 3 wood according to the spreadsheet ! Hahaha! thanks for pointing that out Johnny, not quite sure what happened there but these computer programs like to do things of their own accord sometimes but I'll blame myself anyways, should be okay now.